A Splintered Mind: Summoning the Strength to Type. Humor NOT Guaranteed. Summoning the Strength to Type. Humor NOT Guaranteed. After a week of viral sickness I haven't much to show for my productivity. I've barely been able to home school my kids. It's just your garden variety virus. You know the kind? Saps you of all energy while your body tries to evict it? This particular one wants to send my lungs flopping out onto the carpet while stars dance about my eyes. But it's all my fault. Even though I can barely sit up on the couch I'm still a loser for not getting anything done, right? Of course, I don't truly feel that way about myself. In fact, it's been a while since I let those feelings have sway. I'd like to say that I'm over such feelings, however I still struggle to keep that negative voice in the background. The old me would have slipped happily into depression, complete with feelings of self loathing. It's not that I was looking for any excuse to hate myself. It's that the scale was always tipping in depression's favor and anything could give it the edge. Perhaps you can relate? If not, perhaps you have a loved one who struggles with these issues? So why don't I really hate myself after a week of uselessness? What's keeping me chipper? I haven't drawn much. I haven't written much. My Mum's in the hospital again. I'm still sick. I'm so neurologically off that I'm having difficulty walking and a violent head tick into a wall didn't even knock sense into me. Am I just insipidly cheerful or is something else keeping me afloat? I'd have to say that part of the "something else" is my family. It's hard to be depressed when four beautiful daughters hug you and tell you they love you all the time. Even better, they recognize when I'm feeling frustrated with myself. They see me tick and fume because of it and they hug me more and tell me things will be alright. Even with all this affection, however, I could still reject it and cling onto a black worldview. All the hugs in Utah won't finish my client's logo for me. My 40th birthday looms like a spectre in the dark and my book is still not finished. My art style is as yet undefined. There is much to be down on myself about. The true cynic would sneer at hugs. Why don't I? I covered the answer in a previous column. Several months ago I wrote what was by far my most controversial article: Depression: Ten Ways to Fight it Off. Readers were either inspired by my methods, already using them to some degree of success, or they thought I simply didn't understand "real" depression. Sadly, these later individuals were the very readers I hoped to reach, but their minds were closed. Some of my readers struggled with this dilemma, as well. They either couldn't get loved ones to understand their struggles, or they couldn't get their struggling loved ones to let them see any rays of hope. I've struggled myself for months knowing how to approach this topic in the flippant, light-hearted fashion I use in this column and have been stumped, but I see now that I can neither be flippant nor address these questions in the same column. In the next two columns I will address both questions in depth. 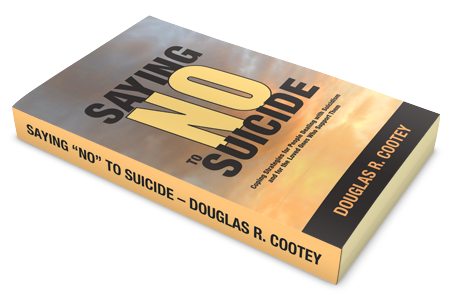 First there was a common plea from someone suffering from Depression, "How do I help my spouse better understand?" And lastly, there was a common plea from a spouse of a person suffering from Depression: "Is there anything I can do to help my spouse not be depressed?" The shame is that these people usually aren't married to each other, but all is not lost. Our job is to find a way to bridge the chasm of misconception and misunderstanding. If you have any thoughts to share on the subject, email me or share them with the group by posting a comment. In the meantime, I'm going to go lie down again. I need to save up my energy for the next coughing spasm. If I'm lucky, I won't just cough out a lung. I might be able to cough up both feet as well.